Home #ADDICTIVE Mogu Man : 2-bit era Pac-Man, only not! Mogu Man : 2-bit era Pac-Man, only not! What if Pac-Man had been released in 1972, not 1980? That is the basic premise behind Mogu Man, a new action puzzler for Android by Pinebox Games. 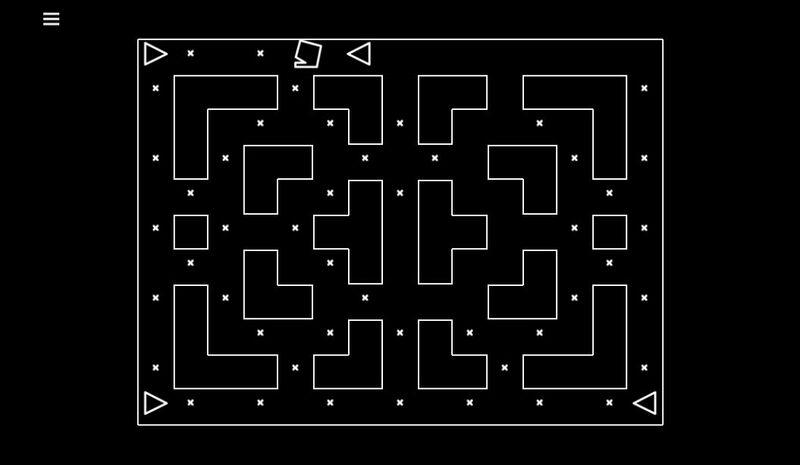 Sticking to a Pong-era black-and-white palette, Mogu Man presents the player with a series of mazes of varying size and difficulty to munch their way through, avoiding the Δs while eating up all the Xs. 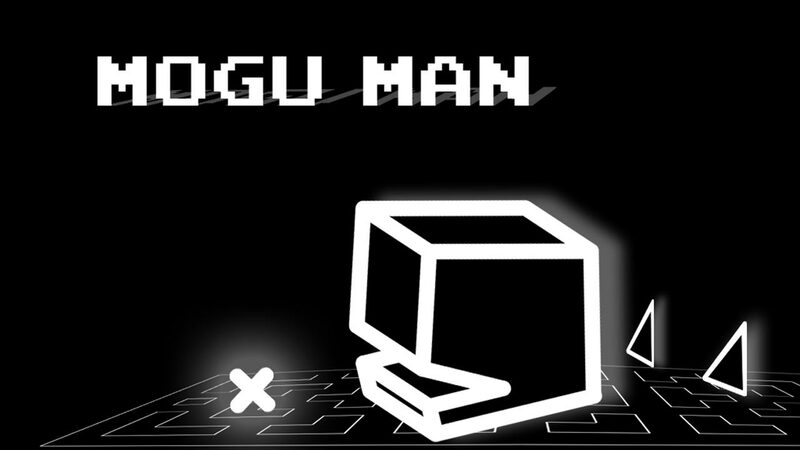 Mogu Man is not a simple Pac-Man clone, however. 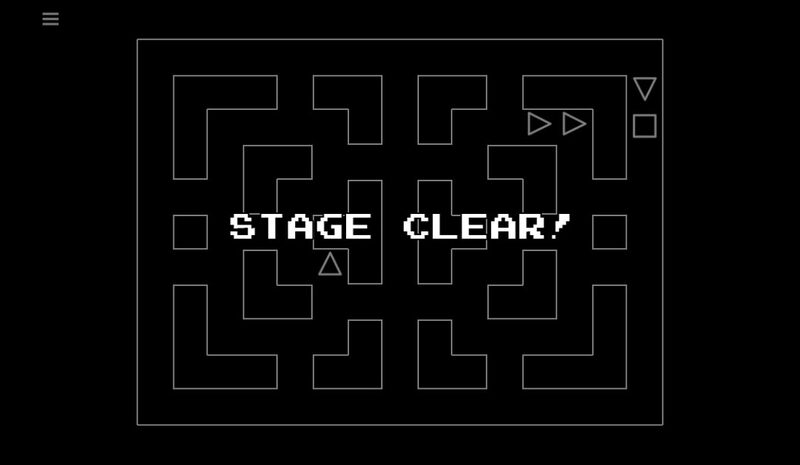 Rather than presenting a purely reflex-based challenge, the behavior of the triangles – the game’s “ghost” equivalents – makes Mogu Man a puzzle game, instead of an arcade title like its main source of inspiration. The player will still need keen reflexes to clear all of Mogu Man’s stages (16 in the Lite version; 120 in the full, paid version), but strategic thinking also plays a part. Triangles can be lead into sections of the maze that will leave the player free to maneuver, and their patterns of movement can be capitalized upon to create X-munching opportunities. There are two methods of controlling Mogu Man, the cube-shaped disembodied mouth that will eat its way through each maze. The first method, which offers more accuracy of movement and ensures a clear view of the map, is to single-tap on the intended destination. It is important to note that Mogu Man’s progress will be waylaid as it stops to eat each X in its path. The Xs act as a barrier to both Mogu Man and the triangles until Mogu Man eats them. This makes the first method a slower, more deliberate choice for controlling Mogu Man. The second method is to drag Mogu Man around the maze. This provides much faster movement when encountering Xs that must be cleared, as Mogu Man will crunch through them as you drive him into each one. The tricky part is avoiding the Δs. As soon as Mogu Man eats the Xs blocking a triangle’s path, it will begin to follow the player around the map. While they won’t attack directly, if Mogu Man is trapped by triangles, it’s time to retry the stage. Essentially a one-man studio, Pinebox Games is the name under which illustrator and 2D animator Kenn Stollery-Jones now produces games. Kenn enjoyed a modicum of success as an animator in the early 2000s, producing animated music videos for Australian and American underground hip-hop acts such as The Winnie Coopers, The Argyle Pimps, and Ugly Duckling. Mogu Man is the first mobile release from Pinebox Games, with the more ambitious narrative adventure “Future Ghost” currently in production. This article was Published by Edamame Reviews, Written by Pinebox Games.